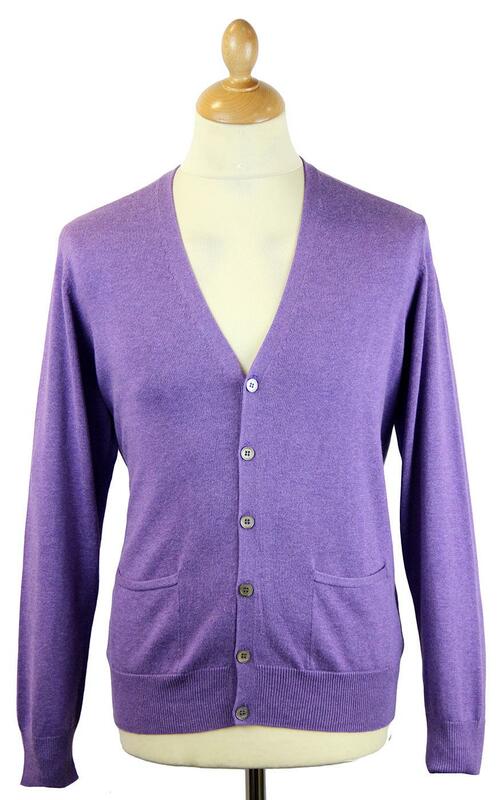 ALAN PAINE 'DENSIDE' MENS RETRO SIXTIES LUXURY COTTON KNIT MOD V-NECK CARDIGAN (Grape). Alan Paine 'Denside' Cotton and Cashmere V-Neck Cardigan. Sartorial, sophisticated style since 1907. Exuding classic Sixties Mod style, this simple yet sharp V-neck Cardigan comes in cool Retro shades and is ideal for wearing over shirts, polo's and Tees. Perfect for both smart Mod and casual Indie attire. Denside luxury cotton V-neck Button Through Cardigan by Alan Paine. Alan Paine has been creating fine luxury knitwear since 1907. This exquisite 'Denside' Mens V-neck cardigan in a fab Retro textured grape offers a subtle Summery shade that is perfect for all occasions. Soft cotton knit with a hint of cashmere, 'Denside' is comfortable, stylish and timeless. Finished with ribbed hem and cuffs and ornate cinch stitch to the sleeve seams and V-neck. Classic Sixties Mod V-neck Cardigan with neat button detail - 'Denside' by Alan Paine. Paines of Godalming was founded in 1907 by William Paine who was a self taught knitter. Developing some of the first cable knit sweaters, Paines found a desirable market in supplying local cricket clubs. By adding club colours to the tops via tipping and trims, Paines expanded their business. Unofficial Patron The Prince of Wales (later to become Edward VIII) commissioned his own personal sweaters with his regimental colours. In 1999 A US mountaineering team found the body of British explorer George Mallory on Everest who had gone missing during an expedition to reach the summit in in 1924. Amongst Mallory's possessions was clothing supplied by W F Paine, 72 High Street, Godalming. The company officially changed it's nae when William Paine's son Alan too over in the 1950's. Relaxed fit. ALAN PAINE 'DENSIDE' MENS RETRO SIXTIES MOD LUXURY KNIT V-NECK CARDIGAN. Brand: Alan Paine. Composition: 92% Cotton, 8% Cashmere. Care: Machine wash. Please refer to instructions on garment care label. SKU: 196R18 'Denside' Vee Neck Cardigan by Alan Paine. ALAN PAINE 'Denside' Mens Retro Sixties Mod Luxury Cotton V-Neck Cardigan (Grape).